The University of Manchester – School of Materials, recently hosted Mojtaba Mansouri-Arani, a PhD student studying at the University of British Columbia. 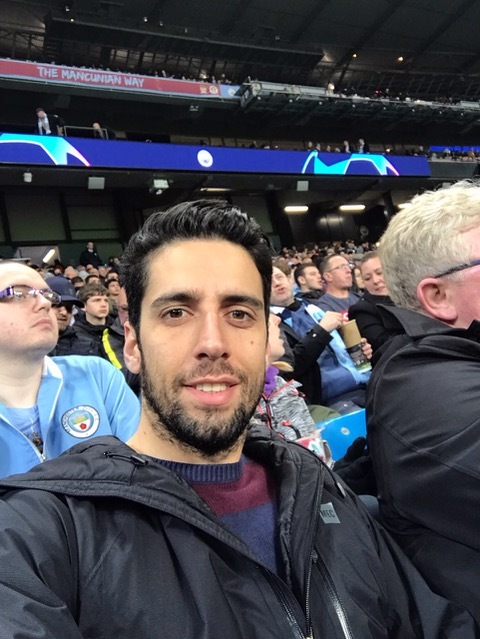 Mojtaba has provided below, a brief overview of his research and time spent in Manchester. My research at the University of British Columbia (UBC) is on quench sensitivity in 6xxx series aluminium alloys. We found it necessary to take a closer look at strain distribution within the grains and at grain boundaries, to have a better insight of main sources of ductile grain boundary fracture in aged samples. I decided to visit The University of Manchester which is pioneering at HRDIC to find out more about the gold remodelling technique and post processing analysis. I am very grateful to Prof.Robson for hosting me at The University of Manchester and Dr. Fonseca and Dr. Lunt for their kind help in optimising this process for my alloy. I had a great stay in Manchester and who can visit Manchester and resist visiting a football stadium! This picture was memorable as Manchester City scored 6 goals at this game against Shakhtar Donetsk.